Ever since Anne (or was it shidoshi?) 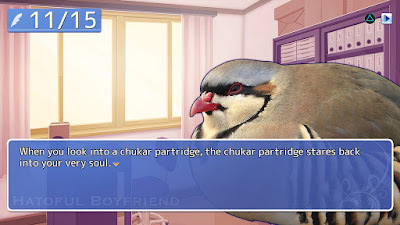 declared her love for Hatoful Boyfriend during a past episode of The Nichiest Podcast Ever, I've desperately wanted to sink my teeth into this indie-turned-blockbuster title. Of course, who wouldn't want to spend some quality time with a visual novel that allows (forces?) you to romance a variety of birds? At any rate, it seems my dream of finally playing some iteration of this Mediatonic-developed title will become a reality shortly, as an expanded version of it will be released for the PS4 and Vita (I'll be picking up the latter, naturally) on July 21. Sadly, publisher Devolver Digital has yet to say how much these releases will set people back, but as long as it doesn't cost more than, say, $15, I'm pretty sure I'll buy it day one. Are any of you planning to do the same? If so, let me and others know about it in the comments section below. Also, feel free to mention any other upcoming Vita games you may be interested in purchasing, as a number have been announced in recent days that make me proud to be an owner of Sony's latest (and probably last, if I'm to be honest) handheld system. Most indies on PSN sweet spot seems to be $20. Indies regularly debut games at $20 and offer them for $15 to PS+ members. Digital Devolver follows that from time to time.Though, they aren't opposed to debuting at $15. Seems like a waste of a case & space. It's so missleading. They did that to me with a few PSP games. Oh boy, I'm so excited to play this on the Vita! 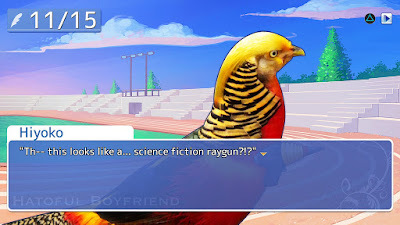 I enjoyed it on the PC but that's really not my preferred method of playing VNs (I reviewed it for GameCritics if you're interested: http://www.gamecritics.com/anne-lee/hatoful-boyfriend-review I'll still definitely be picking this up! Hey there! I must agree. Handhelds are superior for VNs. I got hooked after a Japanese friend returned to Atlanta with several VN PSP UMDs, wow mouthful of initials :D.
Yep, a total waste, if you ask me. Either put the game on a cart, or just make it a digital-only release! Yeah, I have to imagine handhelds are going to be the way to go for me and VNs, although I could even see mobile being an OK option in some cases, too! I don't remember. My excuse is they were completely in Japanese, my lady at the time would play and translate it on the fly for me. My favorite one involved idols and a dating game section. My second favorite was a 3 kingdoms Era romance, I don't think it was Hakuoki Warriors of the Shinsengumi. I couldn't pronounce them, so I don't have a clue really. 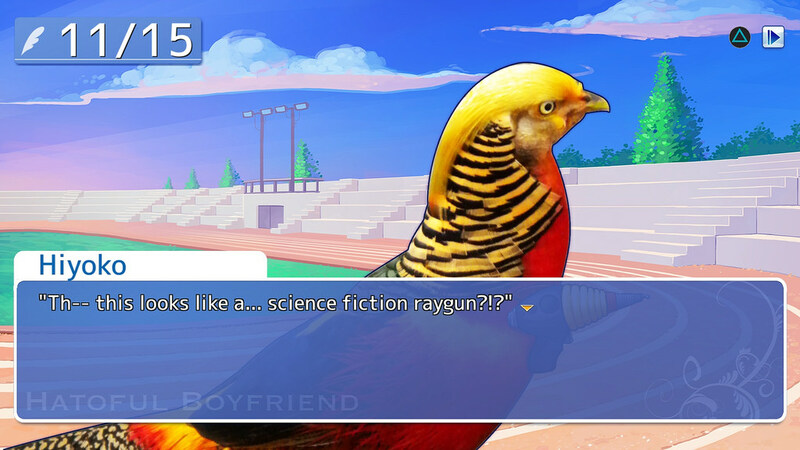 Birds are officially dinosaurs now, so this is a dino-dating sim! I bought this during the last Steam sale and have yet to crack it open, so to speak. I've not had much experience with the genre, but the weird subplot I keep hearing about has me interested. Also...pigeons. Ah, well, at least you already have access to it, Justin! Do you think you'll finally start playing it soon-ish? I don't know. I think I'm gonna go finish my stalled playthrough of Earthbound in honor of Iwata, and I've got some other stuff on my queue. Maybe if I get the bug. Right now I'm on sort of a dungeon crawl/roguelike kick.